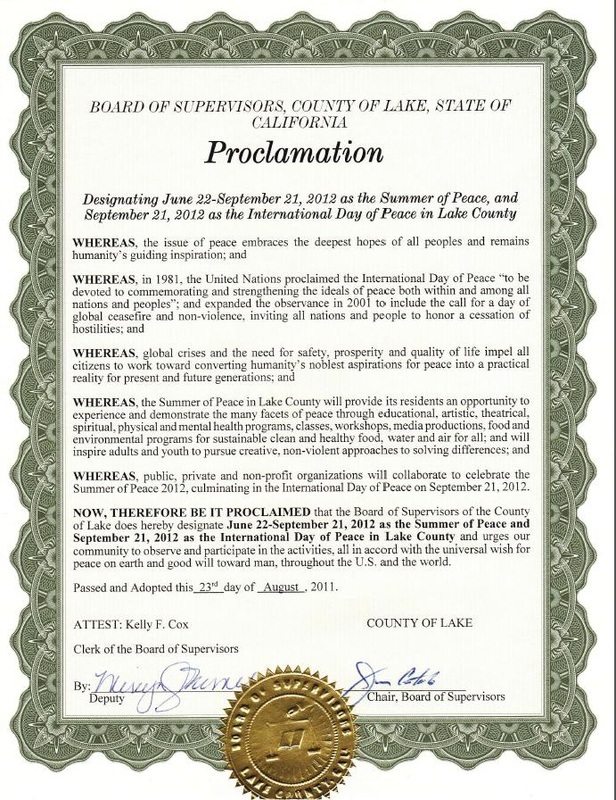 The Lake County Board of Supervisors (BOS) presented a Proclamation on August 23, 2011 supporting the Lake County Summer of Peace 2012, and urging residents and public, private and non-profit organizations to collaborate and participate in the 90-day celebration starting on June 22 and ending on September 21, 2012, the International Day of Peace, as named by the United Nations in 1984. 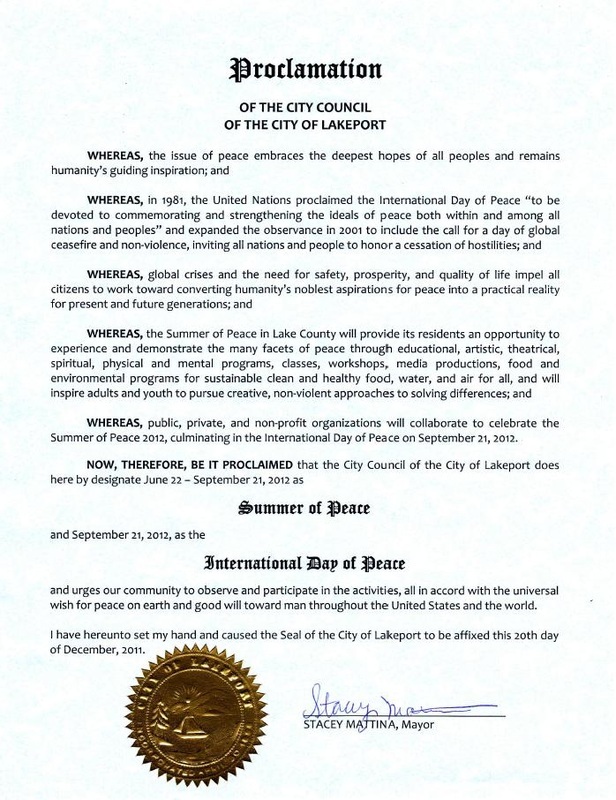 The Lakeport, CA City Council presented a Proclamation in behalf of the City of Lakeport on December 20, 2011, supporting the Lake County Summer of Peace 2012 and International Day of Peace, signed by Lakeport Mayor Stacey Mattina. The Proclamation declared that all city residents and public, private and non-profit organizations will collaborate and celebrate the 90-day festival dedicated to peace. 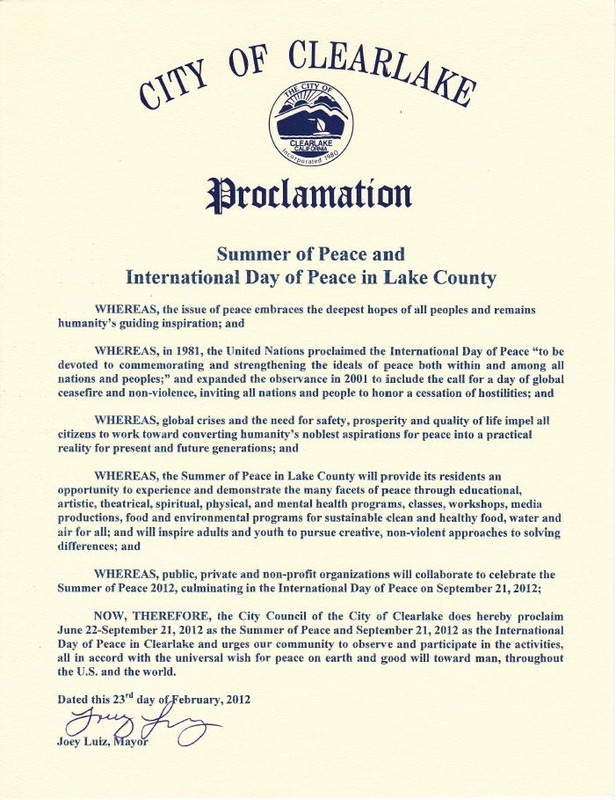 The City of Clearlake declared a Proclamation for the Lake County Summer of Peace 2012 and International Day of Peace in Lake County signed by Mayor Joey Luiz on February 23, 2012, urging our community to observe and participate in the activities in accord with the universal wish for peace within and among all nations and peoples.